When I go out of town, like most "animal people", the worse part is the thought of leaving my cats home alone. 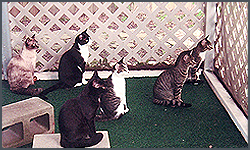 But I have done so in the past with confidence that Sharon Lee and Pet Concierge Tampa Bay will be looking in on them. While out of town, it especially hits me in the evenings that they are not with me. I am so used to having my kitties running everywhere, leaving hair all over, meowing for this or that, or curling up next to me to sleep. It is then that the best feeling in the world is to get a call from Sharon while she's at my house with my kitties, giving me updates about what they're up to. And by the description, I can tell exactly who she's talking about. That makes me so happy. I’ve even asked her to let me talk to them through the phone and she gladly holds the phone to one of them, or just in the air, so whoever is in hearing distance will listen. The great thing is - she doesn't even think that's an odd request, because she is definitely a pet lover as well, and that's considered a normal request for pet lovers! I always know that Abby, Singer, Charlie, Jackson, Andy, Vinny, and Henri will be happy critters while I’m away!! 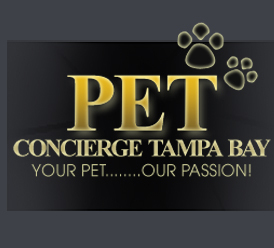 I want to share this story in case you have any doubt about Sharon and Pet Concierge Tampa Bay. I hope this puts your mind at ease. Last year, Sharon called me all excited and all upset at the same time. She was volunteering at the SPCA and had come across a dog named “Lexie”. Lexie was 10 years old and had been at the SPCA for a while because most people don’t want the responsibility of taking care of an older animal. She was passed over again and again and Sharon wanted me to come down and meet her. Well, I have never been a dog person, but she insisted that I meet her. I tried to tell her that I didn’t think a dog would get along with my three (3) cats, but she assured me that Lexie would never hurt them. I went to the SPCA and she brought Lexie into a room to meet me. I was so surprised that she was such a big dog but yet so very gentle. We sat with her for a while and Sharon talked about how she would be good for me and what a great dog she was. We decided to take her outside for a walk to see how she behaved - which was unbelievable! 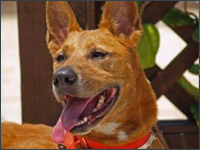 When I walked her back in, we had to pass by the Adoption Office door where she stopped, sat down and looked at me, then looked at the door, then looked back at me, and cocked her head as if to say, “PLEASE TAKE ME HOME”. That’s all it took! Sharon was right about her. I could not ask for a better dog. She has never chased my cats – never bit or growled at anyone. Her behavior says “THANK YOU” every day and her love is unconditional. I could not imagine life without her. Thanks, Sharon, for having the instinct to know that I would love this dog and she would return it a thousand times over. I’ve had animals off and on in my life but never one like my Pug – “Piggy”. She was the love of my life. We were best buddies and she could do no wrong in my eyes. Even when she grunted and snored, it was music to my ears. So, you can see how, after losing her, I wasn’t in a big hurry to get another dog. Well, one day Sharon called me and asked me to come and see a dog at the SPCA. I asked her if it was a Pug, and it wasn’t, so I immediately said “no”. I told her that I wanted to get another Pug like “Piggy” and didn’t think I was interested. Sharon went on to tell me what a sweet and loving dog “Casey” was, and asked me to just come and meet him. She told me that he was a family dog and would be great for my two boys too because he liked to play. I went over to the SPCA and, needless to say, I fell in love. He was perfect for my family. I took him home and he’s been one of the members of our family ever since. I am so happy that Sharon saw how Casey would be the perfect match for my family. He’s the most loving and sweet dog I’ve ever known – besides my “Piggy” of course. We appreciate Sharon’s caring for Casey and our family, and her willingness to reach out to us so we could bring this wonderful animal into our home. Thanks!